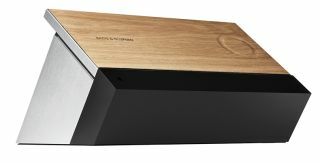 Bang & Olufsen introduces the BeoSound Moment music system with “mood control” | What Hi-Fi? You can always rely on Bang & Olufsen to do things differently, and that was no more apparent than at the company’s CES 2015 press conference. Star of the show was its new BeoSound Moment music system, quite unlike anything we’ve seen before. The design is highly unusual, with a detachable, double-sided wooden/aluminium controller that sits on the top of the unit at a rakish angle. One side houses a touchscreen with a coloured “mood wheel” (we kid you not), which allows you to select music from your own collection by touching the lighter, inner circle of the wheel, or alternatively based on the mood you’re in by touching one of the different coloured areas. The other (wooden) side is designed for one-touch access to “the sound experience that fits your daily rhythm”. Sound like science fiction? Well here’s how it works: the system adapts to your listening habits and suggests music or radio programmes that fit with the relevant day of the week and the time of day based on your previous choice of music at those times. The intelligent PatternPlay feature automatically memorises your musical preferences at specific times and on specific days, and over time will gradually start to “learn” your taste in music throughout the week. Music chosen by PatternPlay stems from your own favourite artists and playlists, plus an extensive online catalogue of music - including 35 million songs supplied by streaming service Deezer. To activate Pattern Play, you just touch the circular control on the wooden panel. But there’s more. Flip the controller over to the touchscreen side and you’ll be presented with the “mood wheel” graphic. A single touch on the multi-coloured Mood Wheel activates an automatically generated playlist defined by your finger’s position on the wheel. The closer your finger is to the centre of the wheel, the more familiar the music will be (as it will be selected from your own library). Move your finger further away from the centre and the system will play more “adventurous” music from Deezer’s online catalogue. The Mood Wheel is also divided into a colour gamut that ranges from “melancholic blue”, through “passionate red” to “energetic yellow”. Depending on which coloured area you touch, the mood of the music will change accordingly. BeoSound Moment is compatible with B&O’s own range of wired and wireless speakers, as well as those from other manufacturers. Multi-room capability will be added this summer via a software update. The B&O BeoPlay Moment music system will be available from 30th January from B&O stores for £1795, including a 12 month Deezer subscription. Also new from B&O at CES are the company’s flagship H8 noise-cancelling Bluetooth headphones ($499) with touch-sensitive controls on the right earcup, a 75in version of its BeoVision Avant 4K TV and an upgraded version of the A9 circular wireless speaker which is compatible with the BeoSound Moment system.